Sydneysiders desire to have a house with a harbour or ocean view. Elsewhere a distant mountain view will do. But a view from the house to the vast space is bad for us – the allure of the capacious world out there can only make our body, and our mind, relentlessly unsettled. The French proverb la forteresse assiégée – fortress besieged – is often used to describe the dilemma of being strangled inside while the freedom of space outside is irresistible. Brilliant though it may seem, the external world lying tantalisingly beyond a thin layer of glass is an inescapable distraction. The million-dollar view, or the readily available one via a smartphone, is not only bad for our body, but also our soul. The ancient Romans would have been terribly puzzled as to why the moderns would want a view of the depressing distance. The rich lived in introvert courtyard houses called domus, while the poor lived in multi-storey apartments known as insula. The poorest of all lived on the upper levels of the insula, with a view (the invention of the safety lift by Otis in 1852 has, up to now, reversed the vertical social pecking order in a multi-storey apartment building). The Chinese, too, lived in inward-facing courtyards for thousands of years until well into the 20th century. For both the Romans and the Chinese, a slice of sky and the watchful eye of Heaven sufficed. Abundant in pre-modern Chinese literature is the recurrent theme of melancholy caused by gazing into the space afar in a lofty building; Nietzsche’s “pathos of distance” evokes similar sadness and frustration of modern times. What then has triggered us to clamber willingly into la forteresse assiégée, which, incidentally, the Chinese writer Qian Zhongshu used as a metaphor for an unhappy marriage? Our relentless pursuit of the expansion of space, in both matter and manner, has caused the loss of interior and, more preciously, its associated strength of one’s inner life, which is essential to withstand the pressure of an increasingly depersonalised exterior world. 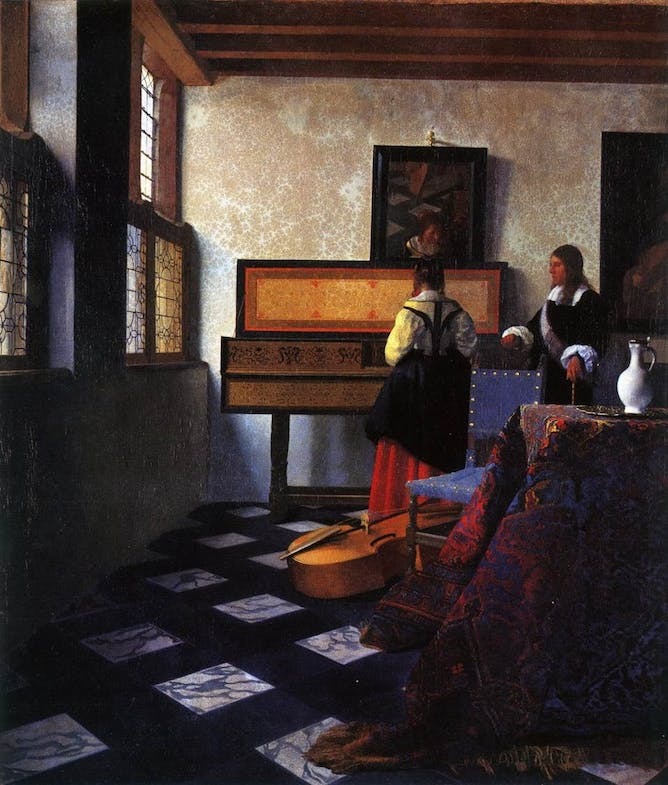 As with Vermeer, a mystery seeps in and saturates the most modest levels of activity. 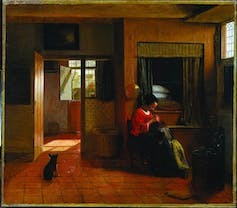 But the solitude is of a different kind: Hopper’s characters are no longer as content as Dutch housewives and children. They are painted with impasto and with no detail, stiff and expressionless. Updike calls this “a polluted silence”. Polluted by what, I have wondered. Only daylight, oxygen and view are abundant. Consider this painting by Hopper, Excursion into Philosophy: the man, dignifiedly dressed in white shirt and business trousers, sits on the rim of a solid bed. Beside him lies an opened book. But his frowning facial expression is impervious and yet unsettling – a classical Hopper. 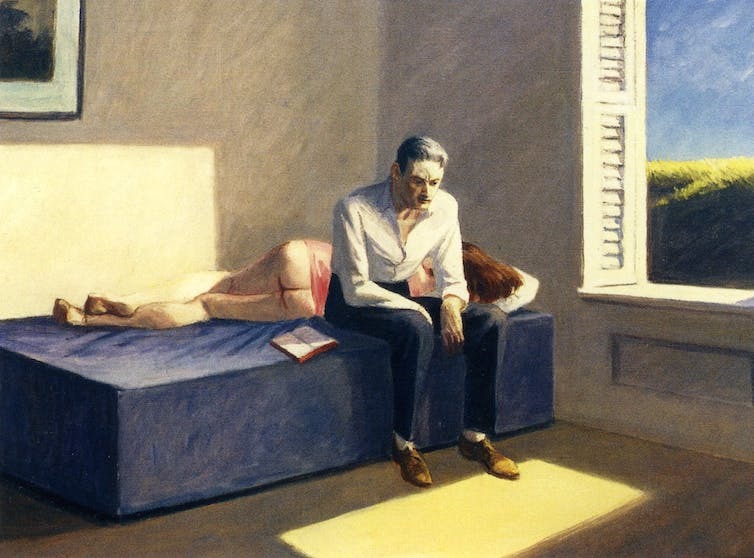 Yes, Hopper is about suspension and the beautifully unsaid, but we still puzzle over what causes the man’s impossible reconciliation: he is torn apart between the book and the half-naked woman lying in bed behind him, and more so the expansive green prairie and blue sky outside the window. The view invades the room with aggressive glare; the two large patches of light cast on the floor and the wall make it impossible to snug in a corner of the room. Even the bed, painted with Hopper’s heavy brushstroke, looks as hard as a rock. Hopper once joked about this painting: “He has been reading Plato rather late in life”. But judging from the near-impeccable blue cover of the bed, nothing ever happened. Did Hopper’s paintings in the early part of the 20th century foretell the increasing impossibility of the interior? His characters, it seems, are struggling for some degree of interior life. Hopper’s windows often have blinds for the upper part, whereas the large area of glass in the lower part admits view and light with abundance. 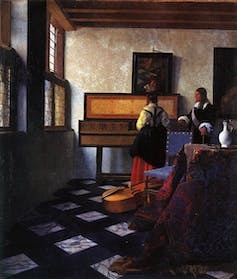 Dutch windows, unlike that of Hopper’s, and certainly nothing like that of our modern rooms wrapped by floor-to-ceiling clear glass, work in subtle ways. They help to create a cosy intimacy in the room with hints of the street or the garden beyond. In these rooms we see a water jar here, a mandolin there, and a map on the wall. A map or seascape oil painting adequately avails an imagination of the external world, which the Dutch had under their command. The intimacy in a room, which makes one feel at home and content in one’s world, is contributed by a serene illumination. Daylight admitted in these rooms is never abundant. Dutch windows often do not serve the purpose of viewing out. It is a little eerie to notice that a Dutch window is a reversed Hopper: the lower part, which is the larger part, of the window is equipped with shutters only (glass was expensive and a rare commodity in those days), while the upper part has fixed leaded panes. Daylight pours in from the upper part to give the room a heavenly illumination. Only when weather permits is the lower part opened. If glass can be afforded, the lower part is a casement frame fixed with coloured glass. Daylight as such is dimmed down to emit a mysterious gloom in the room. As for the English in the 18th and 19th centuries, with heavy drapes drawn, they were content to sit around the warm fire to read a long novel: while the body is in a comfortably sedentary posture, the mind is let loose to roam freely in the space of imagination. What we therefore ought to realise is that the million-dollar view is the bait of a modern trap – its fatal destiny, most tellingly settled by T.S. Eliot, is simply to be “distracted from distraction by distraction”. The author continues the discussion prompted by this article, and responds to some of the points raised by Conversation readers, in this interview with Architecture and Design.